Menno Travel employees volunteered with United Way of Elkhart County and Goshen Schools to help students improve their reading skills. 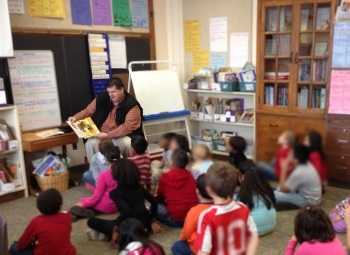 The United Way sponsored this program for all second grade classes in Goshen Schools to bring men from the community into the classroom to read to students. There is also a pilot program in the first grade classes at Model Elementary with the hopes of expanding next year. This was the second year that Menno Travel participated in the program coordinated by Michelle Kercher. Owners Doug Risser and Geof Landis along with Kendal Sommers and Brandon Rasler from the Technology Department took one half hour each week over the last four weeks to go to the classrooms in Chamberlain and Prairie View Elementary Schools. This entry was posted by Kendal Sommers on November 14, 2012 at 12:41 pm, and is filed under Uncategorized. Follow any responses to this post through RSS 2.0. Both comments and pings are currently closed.